Scarab has undergone several metamorphoses since Wellcraft built the first Scarab 300 in 1976. Fast forward (pun fully intended) to 1986, when the public saw a 38 KV piloted by Sonny Crockett on the TV show “Miami Vice.” That exposure propelled the go-fast brand into boating history and provided a huge bump in sales. While racing Scarabs are history, the iconic brand is now a tale of two boat lines, both owned by the Beneteau Group. 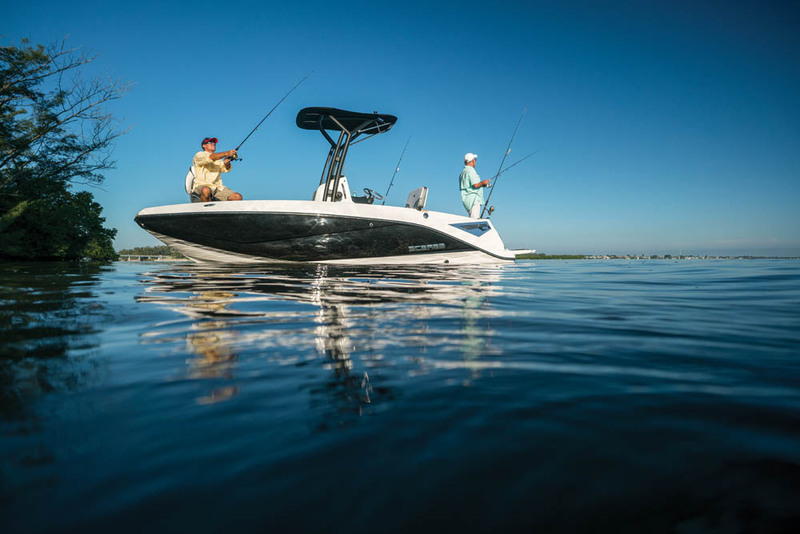 Scarab Offshore is a line of outboard-powered tournament fishing boats — multiple outboards — that pound the waves at high speeds in events such as SKA fishing tournaments. But in 2013, Scarab Jetboat was christened, thanks largely to the sudden availability of Rotax engines after Sea-Doo exited the sportboat market to concentrate on personal watercraft. For 2017, Scarab designers once again make history with the Open 195, which includes an innovation not found on other trailerable powerboats. 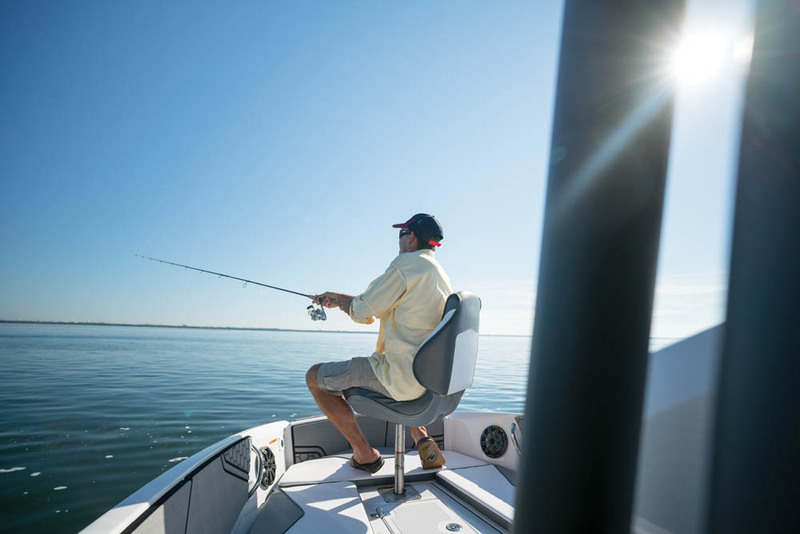 To experience the Open 195’s signature feature, stand at the transom, pull two slide bolts and let go. Passengers are sure to “oooh” at the sight of the transom gently dropping to horizontal, which creates a couple more feet of usable space. The Tailgate is clad in gray Marine Mat, which provides a soft, foot-friendly surface that has a high non-skid factor. 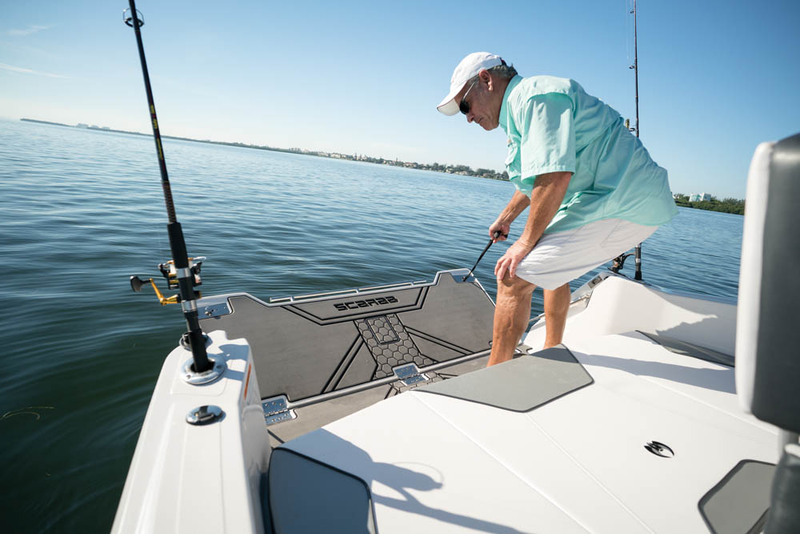 When deployed, the tailgate gives anglers a place to stand or sit and cast, or passengers can simply lounge with their feet in the water. 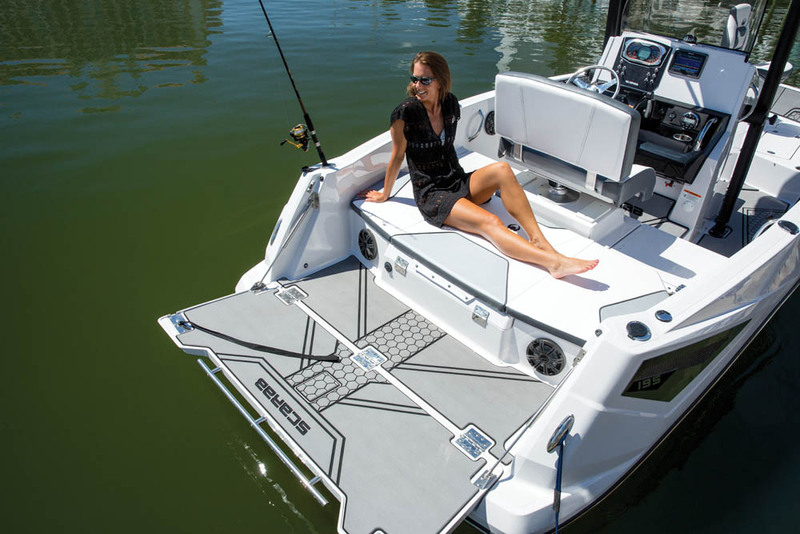 It also provides an open invitation to dive in, although getting back aboard requires flipping the Tailgate up to access the boarding ladder that’s on the swim platform, unless buyers purchase the optional boarding ladder for $340. Of course, more fit folks can lift and twist themselves onto the deployed Tailgate without a ladder, since it’s low enough to the water. Swimmers will appreciate the grabrail to hang on to while they’re still in the water. Powering the Scarab Open 195 is a single Rotax 1503 1.5L three-cylinder engine, sourced from BRP, the parent company of Sea-Doo. The decision to use this proven power plant rather than start from scratch to build one in-house was a good one. 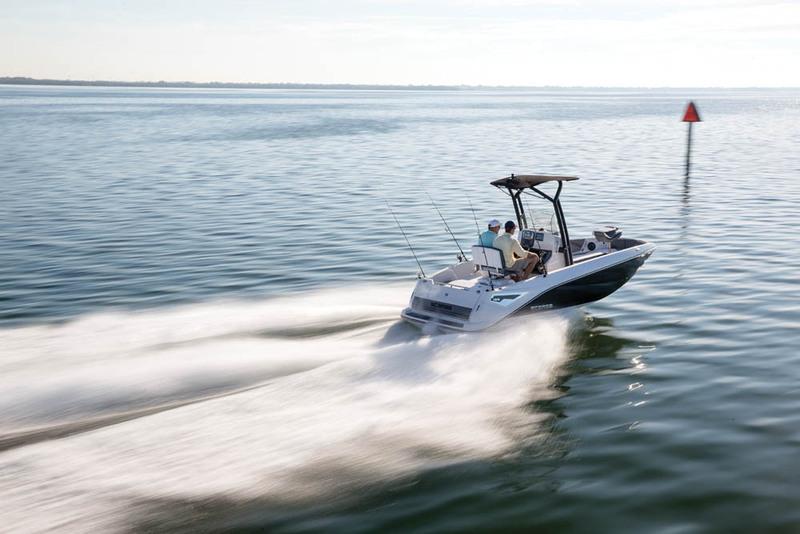 Countless boaters spending countless hours flogging this mighty but small engine, often at wide-open throttle, have confirmed its reliability. There are two available power variations of the 1503. The first is a supercharged SC model that Scarab posts as having 200 hp. The other is the supercharged HO version that has an external intercooler and produces 250 hp. The latter powered our test boat. During our test, there were four buffet-loving Americans on board, which is two more than usual, but it gave us a more real-world look at what to expect. The supercharger kicked in immediately and the Open 195 took off quickly and planed in four seconds with little bowrise. Time to 25 mph was 8.5 seconds, and it reached a top speed of 40.2 mph. Although Rotax puts the horsepower of the two 1503 variants closer together than Scarab (207 hp vs. 244 hp), I can’t recommend anything less than the max power for this model. The boat is built for fun, so it will be $1,799 well spent. Taking control is easy thanks to a drive-by-wire system that ensures smooth shift and throttle control. The Info Center has both analog and digital displays, and the speedometer is GPS-based, so it delivers accurate info, which is a big plus for waterskiing. A worthy option is the Digital Speed Control Package, which includes a variety of enhancements. Eco Mode limits engine torque, which ensures the best fuel economy possible. Cruise Mode lets the driver hold a steady speed that can be tweaked by bumping a toggle switch up and down. Probably its coolest feature is Ski Mode. With it, drivers can set their terminal speed and control the ramp, or rate of acceleration, with six different gradients. This is important because the acceleration on a jetboat can be pretty abrupt, especially for younger skiers. 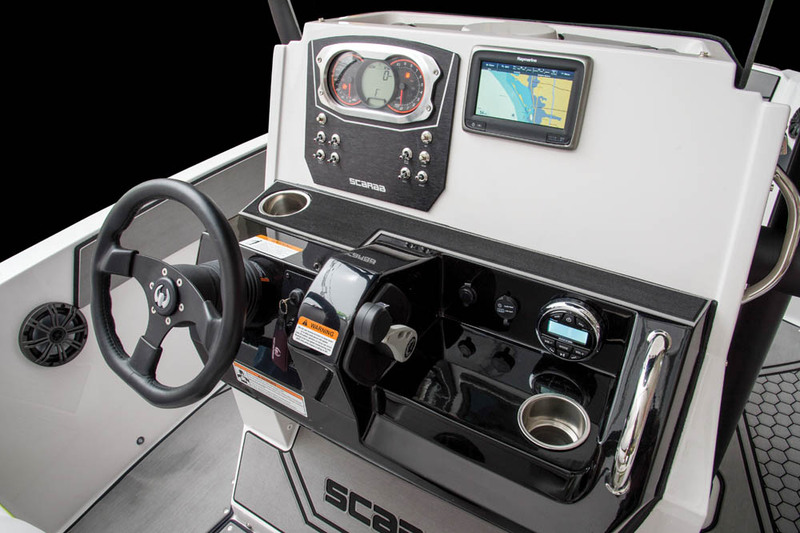 For drivers used to “regular” boats, docking can be a challenge, but Scarab makes it really easy with Docking Mode, which, when engaged, limits the throttle to 3500 rpm and spreads it out over the entire throw of the shift lever, allowing drivers to make small, precise corrections. The Rotax pump is always circulating water, so when the Scarab is in neutral, the boat will still turn at the spin of the wheel. A cool trick: drivers can spin the 195 on its axis when it’s in neutral. The fun of having a jetboat such as the Scarab Open 195 is the ability to turn really sharply. When I cranked the Open 195 hard-over at speed, the reaction was immediate and we were able to nearly swap ends, though the speed tended to bleed off quickly with four people on board. We tested two versions: the Open 195 and the Open 195 Fish. Buyers can order a number of fishing options on the Open 195 (e.g., three types of rod holders and a baitwell), but if fishing is a primary activity, the 195 Fish is the way to go. 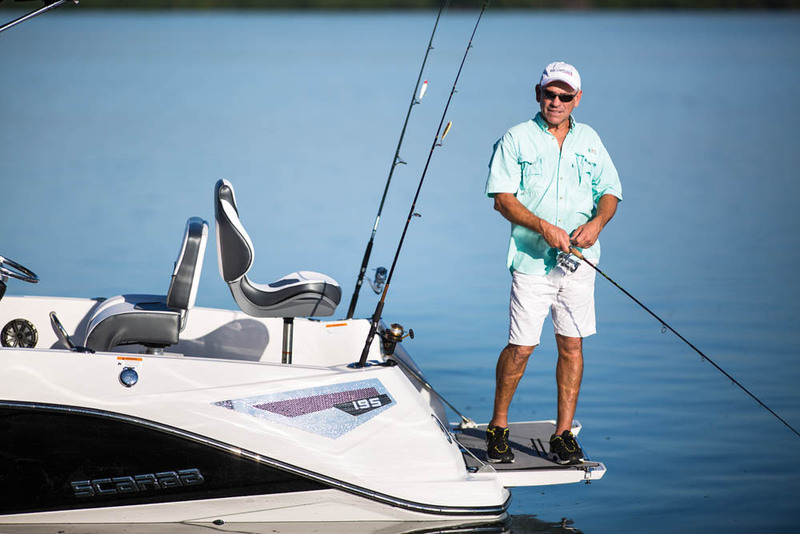 The MSRP is $1,098 higher for the Fish model ($31,250 vs. $32,348), but in addition to the standard rod holders and baitwell, a number of options are available that aren’t on the Open 195, including fore and aft fishing seats ($600). Scarab describes this boat as an SUB (Sport Utility Boat), and its functionality as a multitask platform is enhanced by the addition of a T-top ($2,467), which provides a high tow point that can handle 1,800 pounds of force and serves as a place for clamp-on rod holders ($467). Plus, it provides shade with its canvas awning. Cranking two twist knobs lowers the T-top for storage or ducking under low bridges. The Open 195 has a center console design, but what’s unusual is the pair of flip-up jumpseats on either side, providing four-abreast seating. In front of the center console is another jumpseat with twin bow benches. The boat has a passenger capacity of eight, and there’s more than enough seating for all. Scarab provides many options for customizing the Open 195. The extra-tall helm includes an incredible amount of real estate for adding electronics, and Scarab offers a 9-inch Raymarine GPS/fishfinder for $1,500, but there is space for even larger displays. An unusual feature for a sub-19-foot boat is the flip-up forward section of the helm, which raises to expose a changing station/head compartment. A worthy addition is the pumpout head, for $313. To beef up seating and sunning comfort, opt for the stern seating pad ($300) and the three-piece bow cushion set ($833). Another comfort enhancement is the full cockpit Marine Mat padding with the Scarab logo, for $1,060. For entertaining, add a cockpit table for $307. A stern ski tow is standard, but if wakeboarding is in the picture, add board racks on the optional T-top for $600. To beef up the wake, a Wake Blast System is available for $1,033. Unlike most boat companies, Scarab includes a custom trailer as part of the standard package. Purchased by Darren and Kimberly Rubin, Largo, Fla. Purchased at Lightning Powersports, Port Richey, Fla.
We would like to add a freshwater shower for rinsing off after swimming and diving, and scuba tank racks. 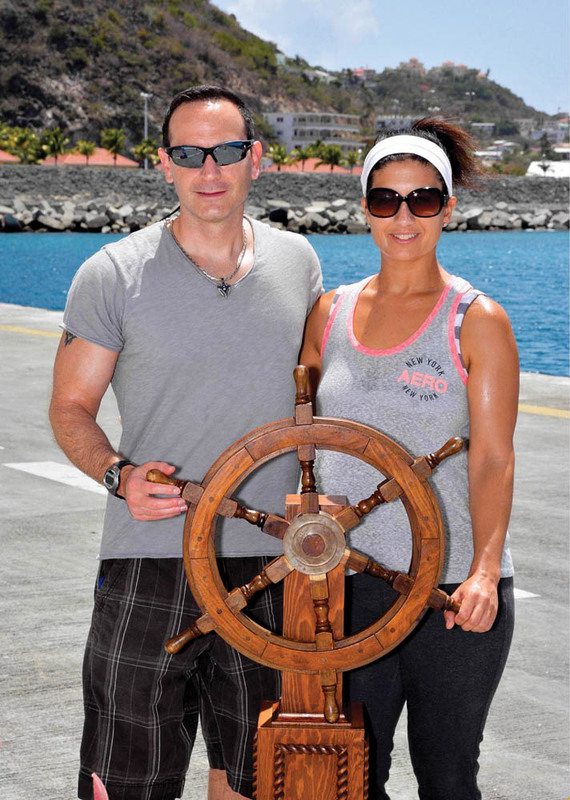 It had been a little while since we’d owned a boat, and living in the Tampa Bay area really made us want to own one. We liked the idea of a jetboat because they don’t have props and can run in shallow water, which is in abundance here. We wanted a compact boat that would fit in our garage but one that had the ability to handle choppy water, since Tampa Bay is so expansive. 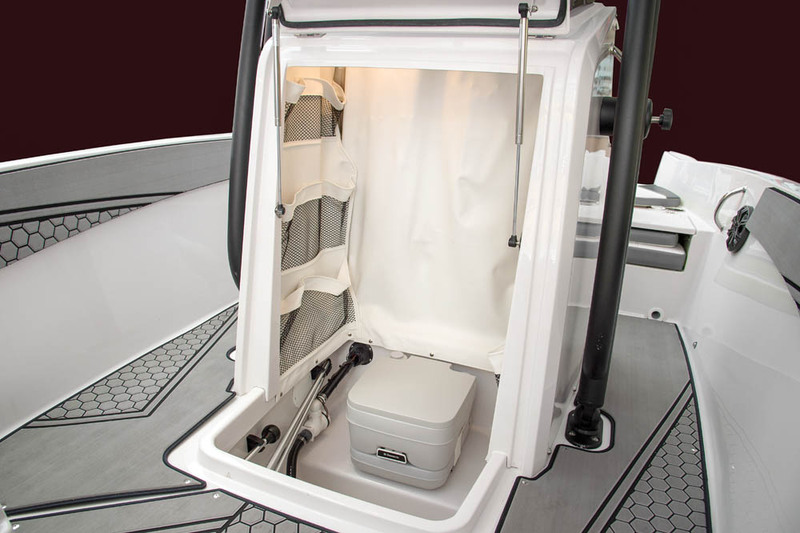 We plan on getting into fishing this year, and I like the numerous rod holders and center console design. We loved the Tailgate, because we plan on scuba diving, and it will make getting in the water much easier. There are many day destinations, including Caladesi Island and Egmont Key, that are awesome places to visit, and restaurants such as the Largo Yacht Club, The Pub Waterfront Restaurant and Shepherd’s Resort. We hope to trailer our Scarab Open 195 down to the Keys to get into some turquoise water. Bob at Lightning Powersports has been great before and after the sale. I’ve been asking lots of questions and he’s been very responsive. LOA: 18 ft., 10 in.